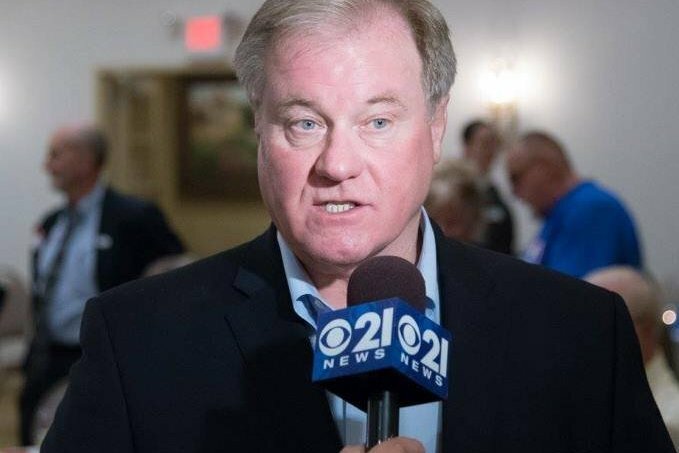 Republican Scott Wagner is challenging incumbent Tom Wolf for Pennsylvania governor. Pennsylvania’s governor’s race is just 25 days out from Election Day, and Republican candidate Scott Wagner seems to have a good bit of ground to make up in his battle against Democratic incumbent Tom Wolf. Just this week, Wagner said he was “tapped out” after investing millions of his own money. A late September poll from Muhlenberg College showed 55 percent support for Wolf to 36 percent support for Wagner. All of this is to say, it’s now or never time for Wagner. Perhaps that explains a video Wagner posted Friday to his campaign’s Facebook page from York, Pennsylvania, that has him saying he would “stomp all over” Wolf’s face “with golf spikes” before November 6. Wagner spokesman says the candidate's comments were "not to be taken literally." "He wanted them to be a metaphor for how he will approach the final stretch of the campaign." One would be hard-pressed to take Wagner’s comments as a literal threat rather than a metaphor, but it's still an unusually aggressive one. Pennsylvania's midterm elections will be held on Nov. 6.